If you are fed up with cable clutter on your desk, then a wireless keyboard could be the answer. Wireless keyboards transmit data to your computer through a radio frequency connection, or via Bluetooth. Most wireless keyboards connect using the same 2.4 GHz wireless frequencies used for cordless phones and Wi-Fi, via a small USB dongle which provides the link to your computer. These proprietary connections allow for optimal battery life and can provide connectivity to more than one device. TeckNet X300 2.4Ghz Wireless Multimedia Keyboard and Mouse Combo – the TeckNet X300 Keyboard has a wireless range of up to 10 metres and boasts a battery life of up to 2 years, while the mouse can keep going for up to 18 months thanks to the auto-sleep functions! The slim keyboard has concave keys and is optimally angled for an ergonomic typing position. These devices are Plug & play with no need to install a driver or have any technical experience. 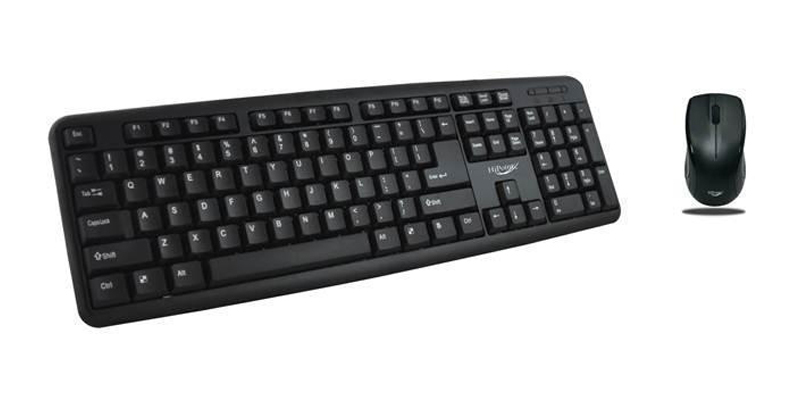 The keyboard features spill-resistant keys and 8 media keys in a UK keyboard layout. In addition a single Nano wireless receiver connects both the keyboard and mouse so you only need to tie up one USB-port. Logitech MK270 Wireless Combo with Keyboard and Mouse – This wireless combo operates via a tiny Logitech plug-and-forget receiver in a single USB port. The combo connects via 2.4 GHz wireless at up to 10 metres with virtually no lags or dropouts. The Logitech UK QWERTY Layout keyboard also has an auto-sleep function for years of use without changing batteries and is compatible with Windows XP, Windows Vista, Windows 7, Windows 8 and later Windows operating systems. The included optical portable mouse also has up to 12 months use without replacing batteries. Caseflex Ultra Slim Wireless Bluetooth Keyboard – this wireless keyboard features full Bluetooth version 3.0 compatibility so can sync up to any Bluetooth enabled device including tablet devices, smartphones, Smart TV, PC’s, laptops and games consoles. Compatible with all popular operating systems such as iOS, iPad, Android and Windows. The design is lightweight but still feels sturdy enough to last – it looks great with the white keys on the silver base.